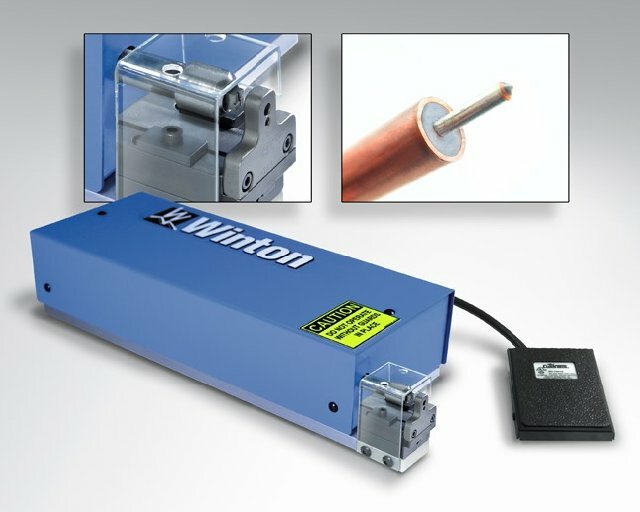 Winton’s model CP6 coax pointer is designed to impart a point on the end of a center conductor in one seamless motion. This powered device uses a high speed AC motor coupled to precision cutters to insure an accurate point it machined onto the end of the conductor. The single push button action keeps things simple in manufacturing. Interchanges guide plates allows a user to support the coax during a pointing operation. Precision and repeatability…that is what you will be adding to your manufacturing process by employing a Winton pointer. Give us a call for more information!